Seat Impact Tester to check the impact effect on the seat surface of the plastic moulded chairs. • A pneumatic cylinder of 400mm stroke and diameter of 40 mm and electrically operated solenoid valve will be provided to move the piston To & Fro. An 18 kg weight will be provided to check impact on furniture. A counter will be provided to count the number of trials. 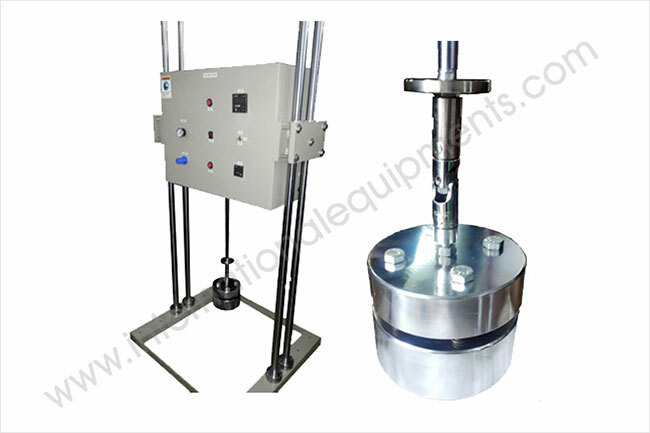 Four hard chrome plated shafts of 2.0 meter height will be provided. A lock will be provided to adjust the height of box containing pneumatic cylinder and solenoid valve.